The reason that you can criticise a Roman mosaic and not a Modern art mosaic is that the Romans set the patterns in their mosaics following a distinct set of rules. Sometimes this is referred to as Andamento or is classified as an ‘Opus’ (work) such as Opus Vermiculatum or Opus Classicum. For the sake of simplicity I use the term ‘The Rules’ when I refer to the way in which the Roman craftsmen worked. 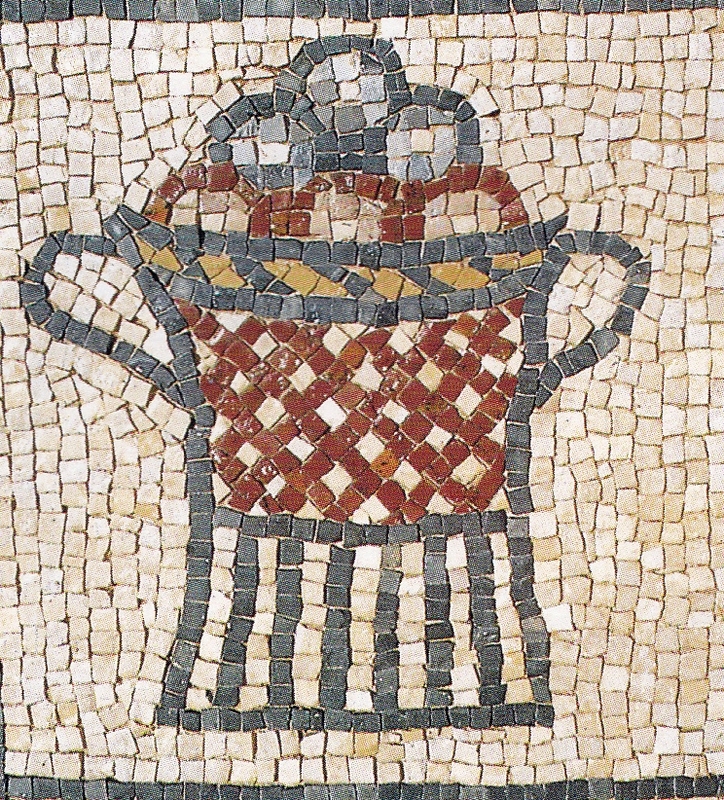 The Roman mosaicists used these Rules to ensure that no one area of a mosaic stood out as a result of the patterns in which the tesserae were laid out. They wanted everything to flow, for the viewer to see the patterns and not the tesserae. The floors may have had highly artistic figural works for example which form the centre of a floor but you do not want any one section of the floor to draw in your eye. This is called a ‘Point of Focus’. Once you have noticed it whenever you walk into the room your brain takes your eye straight to that point which distracts you from the whole mosaic. Above, an example of creating a point of focus. 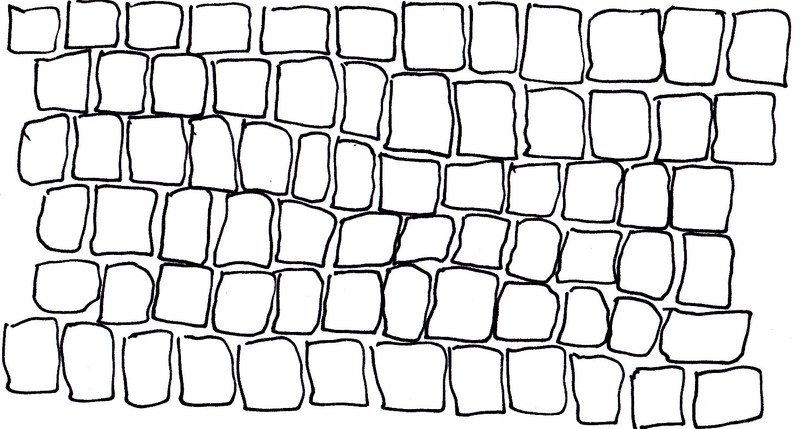 The tesserae are set in single, horizontal lines, in one area though on the right near the top, one line has split into two. This is out of sync with the rest and as such, once you have noticed it, it will pull in your eye every time you look at it. This is the ‘point of focus’, an area of the mosaic that you cannot help looking at which detracts from you seeing the rest of the piece. The Rules applied to every part of the mosaic, there may have been some differences in the quality of the work but these Rules were seen in all the mosaics. Also, with stone you only have a limited palette of colours and you may find with experience that you tend to work using 'shades' as opposed to very distinct colours. So you need to set the tesserae in such a way as to make the best use of what you do have. Just to recap, when you walked in to a room with a mosaic on the floor the mosaicists wanted the mosaic to be seen in its entirety. There should be no one area that pulls in the eye, everything needs to 'flow'. Anything that is not asymmetric will draw in the eye. Imagine walking into a room where there are pictures on all the walls but one of them is quite obviously askew. Eventually you will notice that. We are biologically predisposed to identifying abnormalities, what is termed as 'visual sensitivity'. Every time you walk into that room your brain will take your eye straight to that picture on the slant. You could have a mosaic floor with a centre panel with finely done figures but there should be nothing in the way the tesserae are set which is discordant, nothing which makes any one part stand out, everything should 'flow'. To this end they developed a set of Rules which you can see in all Roman mosaics which, if applied correctly will avoid this. What must be remembered though is that there are many different standards of work so, as we have access to all the mosaics that have been found, we need to use the 'gold standard' of the Rules. One of the best ways to illustrate a point of focus in the way that the tesserae are set is in background areas. 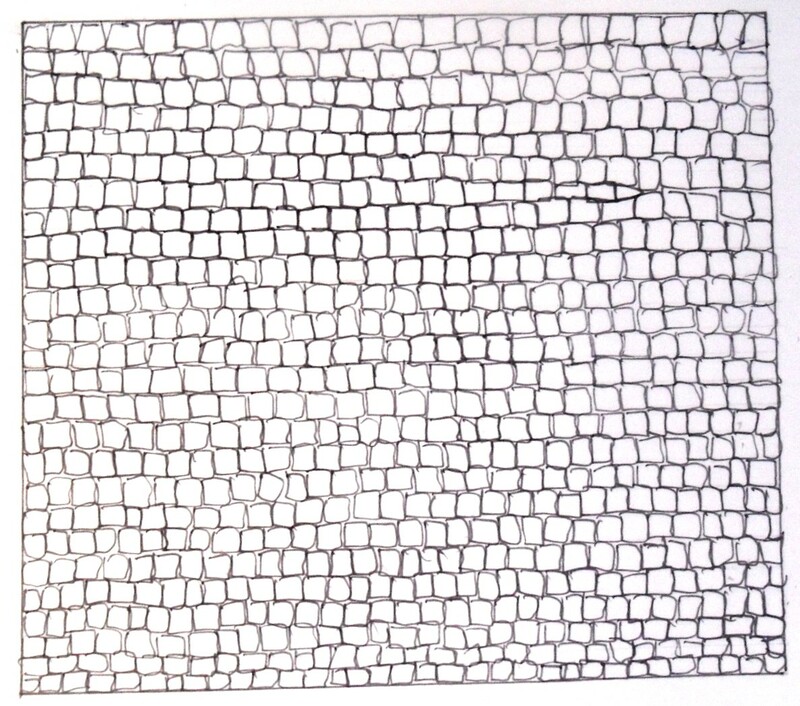 Parts of the mosaic where you just have horizontal lines of one colour, usually white. The tesserae are all hand cut so although they are of the same average size they will have slightly different shapes and sizes. Look at the image above, and you can see these tesserae of the same average size but all slightly different, the result you get when cutting stone by hand. Now imagine setting just horizontal lines using these tesserae. With some tesserae thicker and some thinner you will see your lines wander and if you are not careful you can find your lines beginning to slope downward or upward if you use too many thin ones. You have to constantly correct your line to maintain then following the correct horizontal line. This constant correction is like piloting a small plane where different winds will alter the course slightly so the pilot needs to adjust his heading every so often to maintain the same heading. Now, if you have your lines getting too small you may be tempted to just end the line in a triangle and correct it with a slightly larger tesserae on the next one. This triangle can create a point of focus, once seen it will draw in the eye immediately you walk into the room. The point of focus is at the top right. It may seem like an easy task to keep these lines straight but remember you work very close into your base and so it is easy to lose the perspective of the whole piece unless you stand back from it. If you stretched a piece of string across the floor this may help and I am sure some did that but there is so much evidence pointing toward these craftsmen being able to work without such guides for many parts of a mosaic. If you get the opportunity to try working like this then I strongly urge you to give it a go. This skill is only ever learnt through experience, there are no advanced methods to learn, you just need to do it as much as possible. As mentioned before this is about applying the 'gold standard' to our copies so the aim is to have all the background set in horizontal lines. You will see many mosaics where the background sections have a mix of lines both horizontal and vertical. I will explain why this happens in another article.